I’ve recently been building the Mongoose 2000 “group composition” tool that the researchers will use for recording information about a whole pack of mongooses (and synchronise data via a Raspberry Pi providing a local wifi node) in their field site in Uganda. As I wrote a bit about before, one of the interesting things about this project is that the interface design has to focus on long term speed and flexibility over immediate ease of use. In this way it seems appropriate that it’s moving in the direction of a musical interface rather than a normal touch screen interface. 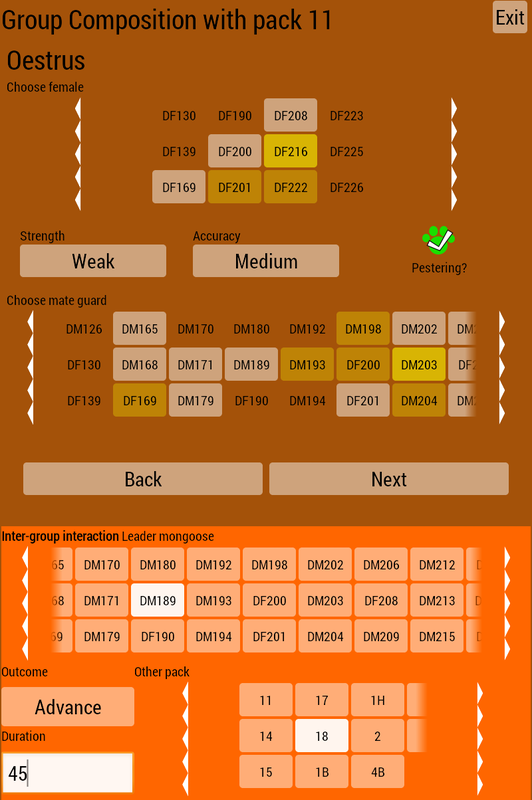 The different colours in the mongoose selectors show which individuals are present and which have data recorded from them already, the screenshot below is the section where they record relationships between the adult females (at the top) and adult males that may be guarding – or pestering them (below). At the same time, they need to be able to record events that may be occurring with the pack as a whole – in this case an interaction with another pack of mongeese.